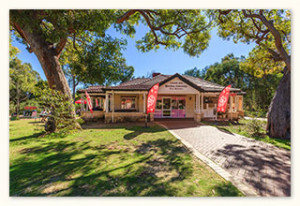 Chocolate Drops is a specialty Chocolate Shop and Tearooms, located within the picturesque Yanchep National Park. A chocolate ‘haven’ which integrates with the historic and cultural surroundings. We have been creating unique quality handmade chocolates with a real Australian focus since 2005. The ‘Tearooms’ provides a nostalgic atmosphere; the menu is carefully selected from homemade recipes. A ‘back to basics’ concept;- in keeping with the old fashioned influence. Chocolate Drops have developed recipes that produce light, nutritional and satisfying meals. The selection of ‘Infusion Teas’ compliment the ‘Tearooms’ identity alongside the creative coffee and hot chocolate beverages. Freshly squeezed fruit juices are available using local grown produce. 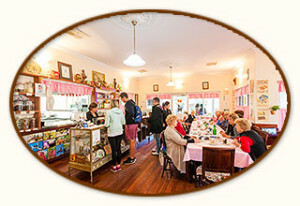 Experience the atmosphere of ‘stepping back in time’ together with the staff who are all uniformed in an ‘olde worlde’ style outfit, while listening to nostalgic, classical or Australian music compositions. Take in the scenery of Wagardu Lake and the often flamboyant behaviour of the Yanchep National Parks wildlife. Truly a unique atmosphere. Group Bookings Essential. 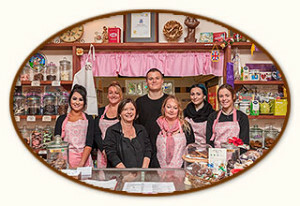 Click here to view our group menu. Functions for small groups available: Birthday, Anniversary, Tea and Coffee Mornings. Click here to read our Menu in English. Click here to read our Menu in Chinese. Click here to read a Chinese translation of this page.